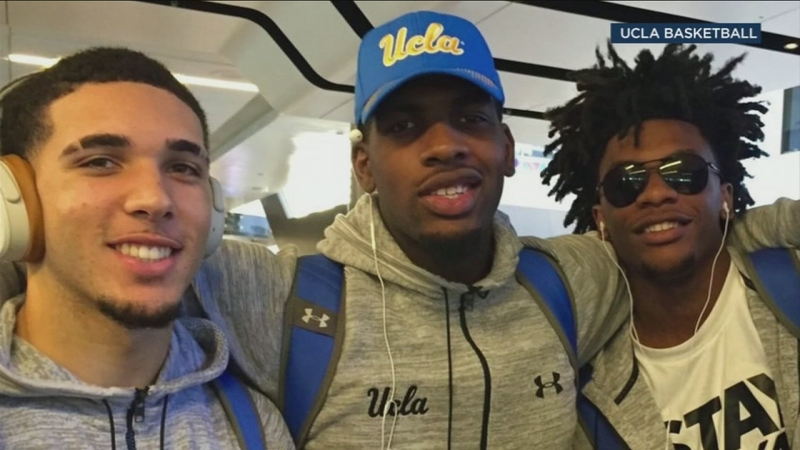 WESTWOOD, LOS ANGELES -- The UCLA men's basketball team arrived at Los Angeles International Airport Saturday night, but were three players short as they remained on house arrest in China. The team had gone to China to play against Georgia Tech for their season opener. They beat the team Friday night. But before the big game, three of the players, including LiAngelo Ball, were arrested on suspicion of shoplifting from a high-end shopping center. Sources told ESPN that Ball, Cody Riley and Jalen Hill could remain in China for another week or two. The source also said there is surveillance video that shows the players allegedly shoplifting from three stores. Sources said the trio was questioned about allegedly stealing sunglasses from Louis Vuitton, which is next to the hotel they're staying at. The three men were released on bail Wednesday. Coach Steve Alford did not want to comment on their arrest. But UCLA students who spoke with Eyewitness News frowned upon the players' suspected shoplifting. "It just kind of seemed unreasonable. I don't really see any reason to be shoplifting, especially in a foreign country when there was so much more to focus on. We had a game that was representing the school," student Jennifer Merritt said. PAC12 Commissioner Larry Scott said the incident has provided a lot of "unwanted attention" and been a "real distraction." He hopes it will be resolved soon.